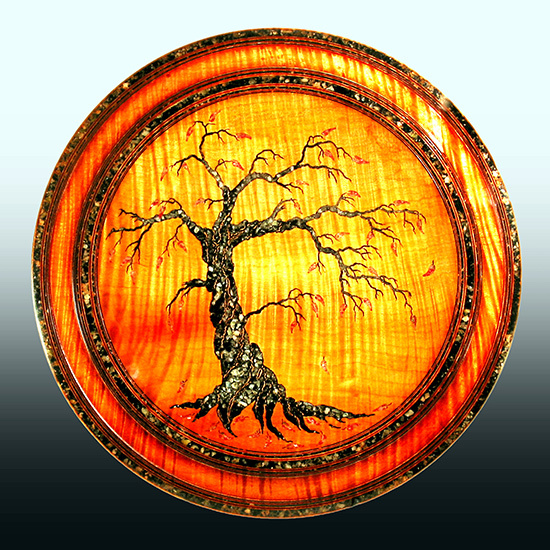 Materials: Fiddleback-figured bigleaf maple with inlaid minerals and 24K gold leaf. Finished with metal-acid dyes and musical instrument lacquer. Comment: I have made dozens of autumn-themed pieces as I love the look of the inlaid leaves. On this platter I first devised a technique to raise the inlaid bands 'proud' of the platter surface as well as dyeing the accent bands in a way to give an antique look. The result is a beautiful chatoyance I have used on platters since.